Polenta with smoked haddock and coffee sabayon - soft and delicious polenta, with olive oil that Akrame makes himself. The haddock was salty and wonderfully smoky. Yum. Gillardeau oyster tartare with nori seaweed, apple, olive oil, and pepper - refreshing and delicious, with the finely diced apple providing nice crunchy texture as a contrast, as well as acidity. Mussels with curry sauce and mustard foam - definitely felt that kick from the curry. Sea bass with charcoal butter and red wine sauce - ahhhhh, yes, Akrame loves his charcoal. This was delish. Carrots, beurre noisette, anchovies, and lemon rind - served on the side. Loved the flavors of the anchovies. Our palate cleanser came and it was a delicious mandarin sorbet topped with Campari jelly, served in a shot glass made of ice. Pigeon with cocoa, asparagus, and watercress sauce - all but one of us went for the pigeon, and it's easy to see why. The pigeon wasn't as rare as I would normally prefer, but it was still very tender. The cocoa was an interesting touch. Of course this is now asparagus season, so needless to say the spear was very nice. Comté and spinach, with leeks and onion consommé - now THIS was interesting! A millefeuille made with layers of Comté and spinach! Very, very nice. Loved the charred leeks and the consommé. Nice touch with the chervil. Choux ice cream with chocolate chip - apparently the ice cream is made with choux pastry that's been ground up. Kinda interesting. Our petits fours were the usual dark chocolate with sea salt, plus some meringues (?). There is always wine when our hostess is around, and the restaurant very kindly arranged to waive the corkage for us this evening. 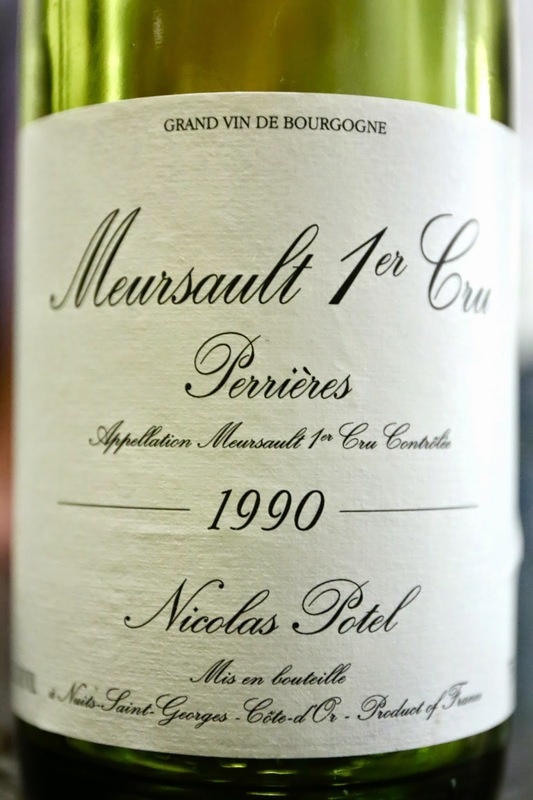 1990 Nicolas Potel Meursault 1er Cru Perrières - prominent toasty notes, nice and buttery, with some minerals and lemon. Ripe on the palate but nicely balanced. 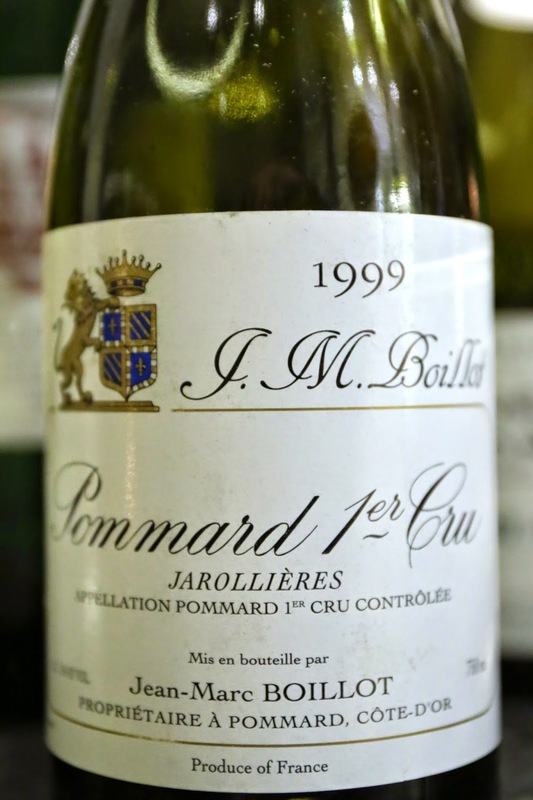 1999 Jean-Marc Boillot Pommard 1er Cru Jarrolières - nose of very exotic spices, a little leather. A little closed at first, slightly smoky. Still somewhat tannic on the palate. Second pour after chilling the wine was much better. 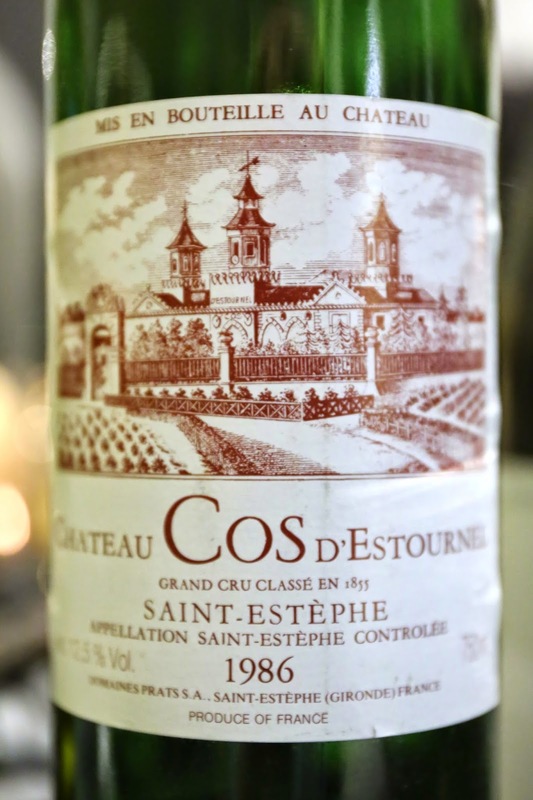 1986 Cos d'Estournel - nose of black olives, very savory, pretty smoky, and graphite notes. Later on the acidity was noticeably higher. At nearly 30 years of age, there wasn't as much fruit detectable from this bottle, but starting to taste a little mature and perhaps a little tired. But a couple of us experienced a little sticker shock when the bill came. I should have remembered that when starred chefs from France visit their outposts in Asia, the menu is often "special" and there is a corresponding increase in price. I am sure some of the 40% premium charged tonight was reflected in the quality of the ingredients. 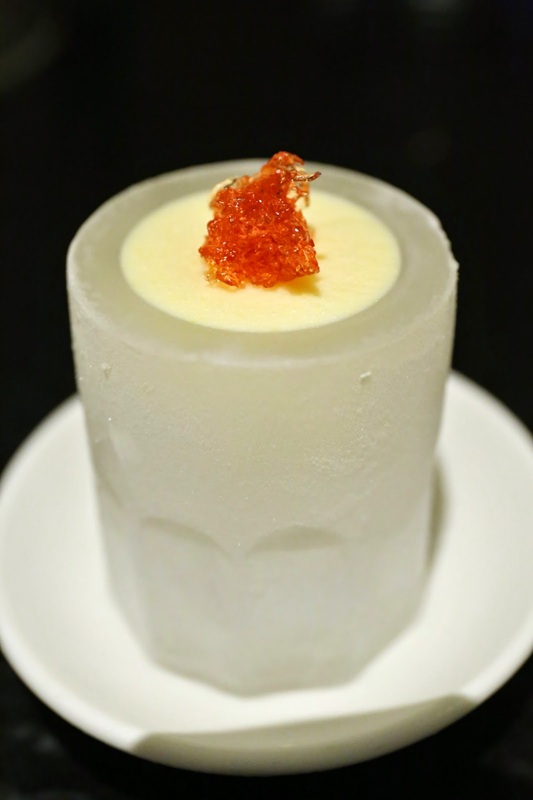 But at HKD 2,000 a head for an 8-course dinner (for food only), they are putting themselves in the price range of Amber, Pierre, Caprice and the like. Put it simply: at the price being charged tonight, I would expect to have my mind blown, at least by one or two dishes. I wasn't. It was very good, but a meal at either Amber, Pierre, or Caprice would have produced a few more "ooohs" and "wows" from me. It was very much like my lunch at Sushi Mizutani in Tokyo - everything was technically faultless, but where was the magic? Maybe I just don't "get" Akrame, the same way that some people don't get Pierre Gagnaire?